Emma has a BA Hons in French and Latin (first class), an MSt in European Literature (medieval French) with distinction, and an MA from Merton College, Oxford. 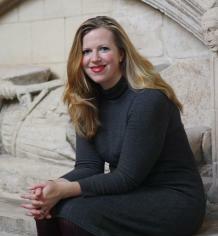 Her DPhil (St. Anne's College, Oxford), sponsored by the Oxford Paget-Toynbee Olwyn-Rees PhD studentship, focused on the fifteenth-century French poet Alain Chartier and French debate poetry. From 2002-3 she held the post of Laming Junior Research Fellow at the Queen's College, Oxford. Emma was appointed Lecturer in French at Exeter in 2003, Senior Lecturer in 2006, and Associate Professor of Medieval French in 2014. She was Head of Modern Languages from July 2011-August 2016, and currently looks after Internationalisation for the Department.